The new Veranda showcases two designers’ houses, both of which were recently updated. One is a vacation house, the other is the family home. Seeing these two stories begs the question – why do interior designers need to redecorate all the time? Did they not get it right the first time? In both cases, yes, they did get it right the first time. Both houses shown in Veranda were beautiful to start with and now, they are even prettier. Why do interior designers seem to redesign their houses more than the average person? It might just be that dreaded 10 year rule. After 10 years – designs tend to start to date and after a decade – many interiors need a bit of freshening up. Except – with these two designers that doesn’t seem to be the case. These two houses looked pretty fine to me before the remodeling and didn’t look outdated at all! Most people don’t have the desire nor the funds to completely redo their houses every few years like many designers seem to do. It might be that designers use their houses as their laboratory – trying out new ideas for clients, or themselves. Most likely it’s just that designers get tired of their interiors and need change more often than the common person. I know that’s my excuse. See what you think. Would you have remodeled these houses or left them as they were? The first house featured in the current Veranda is owned by one of my favorite designers and people – Ms. Charlotte Moss. It’s her large shingled house located in East Hampton which she bought right after it was built – 25 years ago. Its main living space is the focal point both inside and out. Both the façade and the back of the house feature an identical double height, arched window that is covered by an equally large arched roof. Between these two windows is the entry hall and living room – where most of the action of the house takes place. The large back window seen above is the living room. To the left of the living room is a screened in porch and above that is a charming sleeping porch which is now a sort of office/study where Charlotte creates her famous collages. The rear façade shown here looks off onto the large 3 acre estate with its swimming pool and gardens. In this older photograph above – you can see that the front façade of the house has the same arch over an identical window – this time, with the front door included. Charlotte and her husband Barry Friedberg bought the spec house primarily for the large living room that offered views of the estate from the front door straight through the large back window. BEFORE: Charlotte’s house has gone through many changes over the years. Here is a very early scanned picture of the living room at Christmas – with the tree in front of the large back window. The furniture is slipcovered in a cheery Ikat print. The curtains have cotton swags and above the low windows are two large oil paintings. I wish I had a better picture to show of the room from this time. You can see this clipping was folded over for years before it was scanned! Older readers will probably remember this view – I know I had it clipped for years and years – I was totally in love with this living room and its slipcovered furniture. 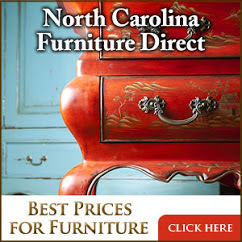 What’s interesting and fun, is to spot furniture that Charlotte has moved around through the years. Last year Moss had a large auction at Doyle – clearing out several storages that held furniture she had used in various showcase house rooms along with rooms in her NYC townhouse that she was redecorating. And in another scan from the same magazine – you can see in the mirror that the balcony railing was once plain. Charlotte quickly replaced the builders grade railing with a beautiful chinoiserie styled one – see further below. BEFORE: Later – the room was redecorated with an English chintz and lots of accessories including a wicker coffee table. The room is lined with tall bookcases that hold Moss’ large collection of gardening books. Red lamp shades blend with the pink and red floral fabrics. Scattered about are antique tables and French chairs, both adult and child sized. Another view with the newer design. The room is decorated in the English Country House style – with masses of books and accessories and soft places to perch. A large, antique gilt framed mirror is the focal point over the mantel. To make the mirror appear larger, Moss surrounded it with black framed prints. Here – at a party - it’s not clear if the room was cleaned out for the party or if Charlotte cleared it out for a photoshoot. Above the fireplace is the new mirror from the Tony Duquette estate, which is there today – along with the desk and lamps behind the sofa. Here you can see the Chippendale style railing and beyond which leads to the entry hall with the matching arched window and front door. A view of the back of the room – with her books and magazines. The library ladder is used – it’s not just for looks. BEFORE: And here several years ago – in ad campaign for Charlotte’s new fabric line at Brunschwig and Fils, all the chairs and sofas and curtains were redone in the new fabrics. Here – after the photoshoot- Moss added this beautiful chaise longue and painted pedestal with urn. Through the opening is the dining room and further is the painted green kitchen. And today – the living room as seen in the new issue of Veranda. Photographs by Melanie Acevedo. Again, the room is English Country House style. While some of the blue and white fabric photoshoot furniture remain – all the accessories and paintings and antiques were brought back into the room – giving it life and movement. The focal point is a large ottoman she found at Colefax and Fowler. The mirror from Tony Duquette remains – surrounded by prints and sconces. (I know the mirror has provenance and all, but I have to say I like the gold framed mirror that was there before! Hides!!!) 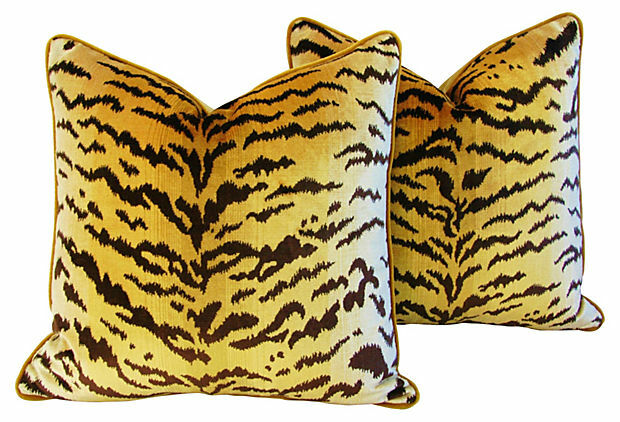 Silk velvet tiger pillows are seen on the love seat. The Brunschwig & Fils blue curtains have been changed out for cream ones which is much lighter. 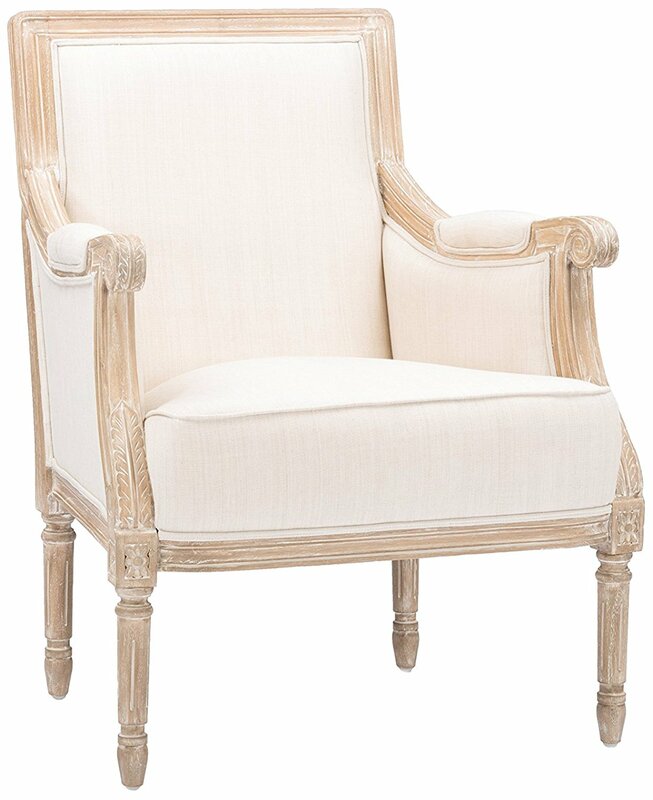 French bergeres are slipped in creamy silk. Notice, where there were once the oil paintings above the windows – there are now oversized photographs taken by Moss herself. Notice how the photographs are left and right sides of a stone staircase. To the right of the back door is the screened in porch and master bedroom. A close up look at the ottoman. I love the striped curtains – much better than the dark blue ones that were there before. I just LOVE this room!!!!! It’s beyond perfect! Has it changed that much over the years? Not really. Moss has just updated the fabrics – mostly because of her new designs. She has added a few key pieces over the past 25 years – a new Restoration Hardware sofa, the ottoman, the chaise longue, the pedestals – and accessories – and together it makes everything look new and fresh again. The biggest change has been the color scheme from reds and pinks chintz to blue and white prints. The desk and Imari lamps remain – while the Cavis sit on her new slip covered Restoration Hardware sofa. Hmmm! Restoration Hardware? What a vote of approval! I love the light sofa! A view of the desk and the French chair – you can see the chaise longue in the background. A view from the balcony gives you an idea of the furniture placement. The beautiful and always chic Charlotte Moss sits on the Colefax and Fowler ottoman. The fun part of looking at old photographs is finding where some of Charlotte’s furniture came from. Showcase houses for one. Designers can spend a fortune of their own money adding to their Showcase rooms – like Kips Bay. Here in this picture from the Holiday House Showcase – we see that Charlotte first used her photographs of the stone steps in this showcase – and the silk covered chairs were used here too, but she probably dragged those from her living room to the Holiday House. Much of the other furnishings of this room showed up in the Doyle Auction. AFTER: Next to the living room is the dining room with slipcovered chairs and an antique lantern. Her shelves are filled with her collection of delftware. BEFORE: In this photoshoot for Brunschwig and Fils – she used her dining room – showcasing her delft and her then red lampshades. BEFORE: Her kitchen was shown in some party pictures – all green cabinets and warm granite. Note the painted shades on the light fixture. And here, you can see the large carved stone backsplash behind the range. Love that! TODAY: – her kitchen remains similar. Love the carved backsplash. At least she replaced the shades! Just kidding! But I do like these better. The flower room. Each Friday – Moss comes to her weekend house and the flowers from her garden are waiting for her to arrange and place in each room. If there are no blooming flowers – they are delivered instead. Once, her husband walked into the flower room and interrupted her work – perturbed, she said – “just pretend I’m on the 9th hole about to putt.” He walked out laughing and said, “I get it, call me when you get to the clubhouse.” What a great Moss analogy. I love her witty humor. Flowers waiting for her to arrange them for all the rooms in the house. Beautiful! Notice the zinc counters. The famous zinc sink in the flower room. To die for!!! A few choices of vases. I want a flower room!!! Or at least a laundry room! And her collection of creamware and ironstone. Her bedroom – the walls are Brunschwig. The tables are hers for Century Furniture. The bed came from the estate of Evangaline Bruce. Nobody does prettier bedrooms than Charlotte. She usually does a canopy, which I love. Now – last year Moss’ East Hampton gardens were seen in Veranda and they probably photographed the house at the same time, before the Doyle auction. This painted chest seen here was in the auction – a reproduction – either the one sold was one of a pair, or Moss has upgraded the bedroom furniture since the Veranda pictures. And, the beautiful Evangaline Bruce canopy bed – Moss used it in a Kips Bay master bedroom she designed years ago. BEFORE: Here – is Charlotte’s master bedroom in East Hampton - styled for a Brunschwig ad. I do love this – I wonder why she changed it out? I also love the chairs!! But, now knowing that she owned the canopy bed years ago – I can understand why she would prefer to use that bed rather than a new one from Brunschwig. Above the screened in porch at the back of the house (remember I pointed it out?) is the sleeping porch which Charlotte uses as a study. She added the skirted table for a desk – and a daybed. Love the painted floor. Here is an architects desk in the sleeping porch. She used ticking for wall covering. Charlotte likes architects desks – she has one (or more?) in her NYC apartment. BEFORE: Decorated as a folly – love the metal umbrellas over the bed! Here – you can see, the folly bed was first used in a whimsical guest room at the Kips Bay ShowHouse – in 1995! Afterwards it came to the Hamptons for a few years, until the sleeping porch was redecorated as a usable office for Charlotte. BEFORE: Another early guest room – wallpapered with pattern upon pattern. As always, there is a French day bed. Pretty mirror over the bed. Today: Above the garage is a guest room – the roof line taken up to the rafters. This new guest room is much more sophisticated than the guest room above. It’s interesting to see how Moss’ tastes have become more refined and less fussy over the years. I just love her aesthetic – then and now. The back of the house – with the screened in porch and the sleeping porch/office above it. Last year, Veranda showed the gardens in a large pictorial. Here, is Charlotte in the back yard, next to the swimming pool. Holes were added in the hedges – after Charlotte had seen the same treatment in Europe at the Prieure Notre Dame d’ Orsan in Maisonnaise, France. The priory’s gardener came to East Hampton to visit and showed Moss how to achieve the portholes. The table is set on the terrace outside the living room. The pool is to the left. There is a garden behind the arch. At the right, the four tall cypress are a focal point behind the swimming pool. The priory’s garden taught Moss how to make benches out of willows. Charlotte’s husband has a putting green on the estate! I wonder if that is it on the very right? The swimming pool with the large stand of four arborvitae behind the garden. A close up of the pool with the large stand of trees behind it. So lush and green! A larger view of the pool. A close up of the arch leading to the garden. A view of the kitchen garden. I love the gravel paths. More of the willow Moss uses in the garden. Two portholes in the hedge give a glimpse of the garden beyond. Charlotte and her two Cavis! So cute!! 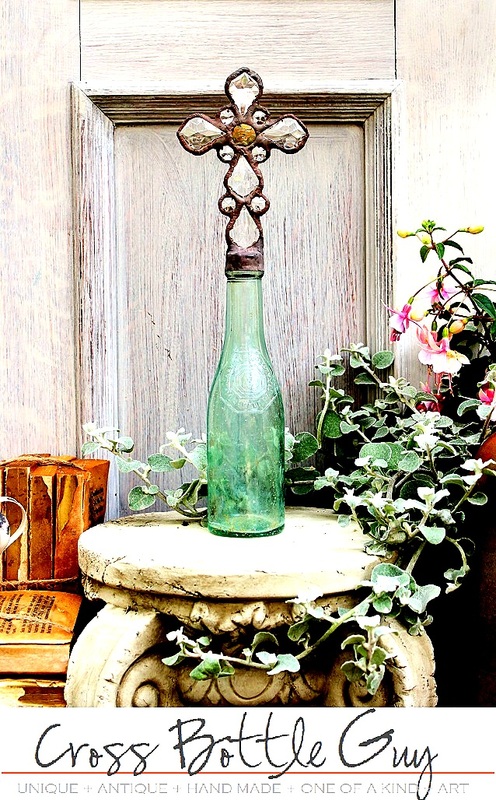 A vignette on the side of the house. Last year’s Doyle auction sent out a hint that Charlotte was doing some redecorating. It was obvious her NYC dining room and living room were involved, judging by what she auctioned off. In the NYC dining room – she sold the curtains which matched the wallpaper and much of the furniture in there. Since then, there has been no glimpse of the new dining room! I’m guessing a new book will showcase those changes! I HOPE so!!!!! At the auction, some key pieces in the living room were auctioned off, so there are probably lots of changes there too. This photograph is the only one I have seen of her new NYC living room. The walls are now white – no longer ivory, the green and white striped curtains remain, the beautiful rug is gone, replaced by a textured one (love!) and this painted chair looks new. The round, 3 tiered table remains, but what is that coffee table? OMG! Please, Charlotte, put me out of my misery! Dying to see more of this room. Her former living room was an all time favorite with the pink velvet settee and the beautiful pair of painted consoles – which were auctioned off at Doyle! The newly designed room must be fabulous – judging by this photo alone. I like the way Charlotte Moss updates – judging by her East Hampton house – it’s never a wholesale massacre. 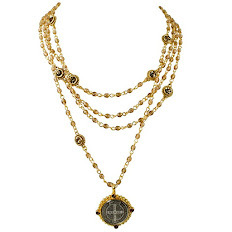 Instead, some pieces are sold, some remain, some are recovered, some aren’t. Part Two will feature a house where the changes are much more drastic, but gorgeous!! I do admire Moss's overall style. But my favorite are her gallery walls, particularly the much-cited wall desk gallery in her bedroom (not shown above, but a quick google image search will find it). Above, I love the gallery around her fireplace in the "before" photos--about the seventh photo in. She rocks a gallery wall like no one's business. And based on these photos, she rocks a maxi dress, too (including the iconic red!). 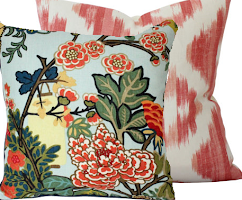 My favorite room is the East Hampton room with the Ikat slipcovers! I like it better than the English Country look in this particular house and room. Sigh... all so pretty. The Christmas tree was stunning. I liked looking at Charlotte's outfits too! Joni, I appreciate you pointing out details in each photo. Thank you for compiling all the photos in one place so we see the evolution of a designers work. Another fantastic post! 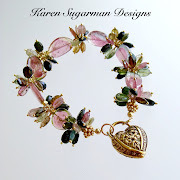 I love Charlotte Moss' designs, and have followed her for years, but I always learn something new from you! You must have loved doing term papers - your research and presentation gets you an "A"! Thanks for this great post. I love Charlotte Moss' taste. The flower room alone, I would love to have. Charlotte is such a class act and I love how she cherishes the past and makes her changes with things so personal, her own fabrics and photography! I think your friend Artie from Color Outside the Lines had an interesting post on why decorators remodel: good business plan. New remodel, new photos in mags, new clients. Plus many the changes incorporates Charlotte's new furniture lines, new fabrics, etc. Charlotte is good and she is very, very smart. I now have flower room envy. I have been lusting for a flower room since I saw that room in a mag or someone's blog -- can't remember which. I love the sleeping porch office and the gardens are spectacular! Thanks for sharing. Love Charlotte Moss and you point out so many details I would not have noticed! Loved this and can't get it out of my mind ... one to remember! I'm not at all sure that I've ever seen such gorgeous rooms like this before. Totally breath-taking. I will look at this post over and over again. Thank you. I'm glad to see that there is still admiration for rooms that have more than starkness and/or all neutrals. All of these rooms are tremendously inviting and feel lived in. I am always love your blog! there will be something special in your interior designing. I like the interior designing and interior furnishing done here. Thanks, Expect more from you. I do like Charlotte Moss's work. I am wondering: Did Duralee discontinue your favorite white linen or not? If so, what are you using instead? I admire Charlotte Moss' work. Her rooms usually seem to have so much going on, yet never look cluttered or stale. The overhead shot of the new blue living room is a great lesson in furniture arrangement. I think many of us are hesitant of putting too much furniture in room. The slip covered chairs in front of the fireplace and the chairs in the corners - this is something we might omit thinking - its too much - yet, it really finishes the room - the light slip covered chairs really seem fresh here and work so well in front of the fireplace - an area that many people keep very open. I think it was Sister Parrish who was known for literally stuffing a room full of furniture and it worked. Charlotte always looks so put together - she can wear really wear a caftan! That necklace is HUGE! But, she wears it well! SQUEEEEE!!!! I have the same light fixture that she has hanging in her kitchen! I bought it in a junk store near Austin and carried it home and its been in storage ever since. My husband thought I was nuts. I can't wait to show him this picture. It's going over my kitchen island ASAP!!! Charlotte never grins for photographs. I wonder if there's something wrong with her teeth. You are an amazing "sleuth"!! One of my favorite comments ever was about an article in Traditional Home on our house; a lady wrote in that she loved my reusing my dining room chairs that were in an article in a magazine 15 years earlier! Sharp eyes! Just like you! You have a "photographic memory"!!! When did your doctor last review all your medications for possible interactions? this is honestly the most well-researched post I have ever read! Beautifully done! Congratatulations! 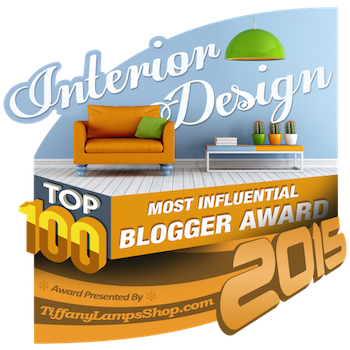 Your blogs; (in my opinion) should be taught in graduate school in "Interior design"! I suggest to students who ask me....."intern under someone you admire" I suggest "do not go to design school"! Just my opinion! I have had 42 years of the most wonderful career by referrals !! Now a website! Lovely! The internet is good and bad. Good mostly!! bad only with the "trolls"
In any world...the "trolls" live under the bridge. Ignore them. (My heart goes out to them!) Unhappy people! What a lovely and valuable post! So educational to all young decorator.......stick with it! It is the happiest job you could ever, ever have!!! Penelope, please look into a concept called "Dignity." I forgot to say ; BRAVO BRAVO BRAVO!!! I mean to be yelling! And You are brilliant!!! Charlotte Moss's style is sort of the opposite of mine but I love it and love looking at it. I love the cream coloured bedroom above and agree that she does pretty bedrooms, my other favourite designer for bedrooms is Michael S Smith. I love looking at photos of people who live in tasteful luxury, she must have almost unlimited funds, sure she is a very successful designer and would earn huge fees but I think that she was a Wall Street banker in another life and maybe her husband has money too. I really need to go out and buy some Caftans. She really knows how to wear them. 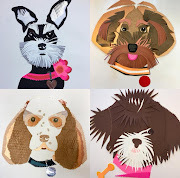 Joni - you do such a good job of spotting the changes and it's fun to compare what she's done to her various homes. Thank you for your blog - I always wait until I can sit down and read it on my iPad - not in a hurry on my iPhone! Another fantastic posting!! Yes -- designers MUST re-do their own homes so they can showcase and sell their new collections (which leads to even more collections and books) .... BUT those changes certainly give us all more eye candy! Thanks for all of your hard work! It seems Charlotte is lightening up her interiors. Such gorgeous layers with amazing fabrics and antiques. Love that story of her arranging the flowers. And what a great flower room! This was a fun post to read in bed with my coffee. Thanks, Joni! Looking forward to the next one! Forgot to mention that among the upcoming décor book releases -- you might be interested in the new one on Geoffrey Bennison by Gilliam Newberry -- to be released on March 24, 2015 ...... as well as a book on Windsor Smith (April 2015) ..... LOTS of wonderful ones! 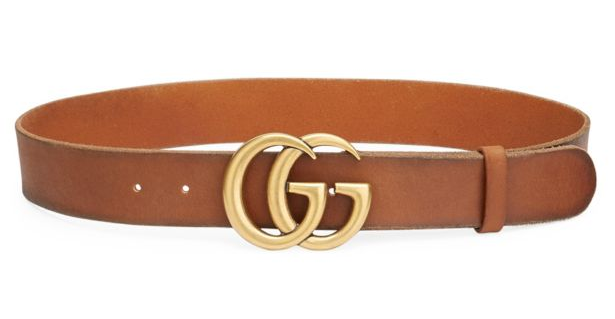 Is is possible that: a) the designers get everything at cost or free, because the manufacturer gets credit and b) they get to write off their expenses on their tax returns as a business expense?? Makes the remodel a bit easier on the pocketbook. Remember the last post on Carole Radzwill and the admission that she made that in exchange for a photo shoot and spread of her apartment, she was able to buy everything at cost? To answer your question, yes, if designers paid what their clients pay, not so many of their homes would be featured in design mags. Paying full retail or even a cost plus, clients are getting taken to the cleaners. Designers mark up every service they provide including upholstery, drapery fabrication, fabric, painting, design time, etc. In most cases, none of their time is worth the price when dealing with an average designer because when they bill by the hour, there is no compunction to work efficiently or effectively. They are lawyers by another name. Obviously; there are other opinions about this statement "clients are getting taken to the cleaners". 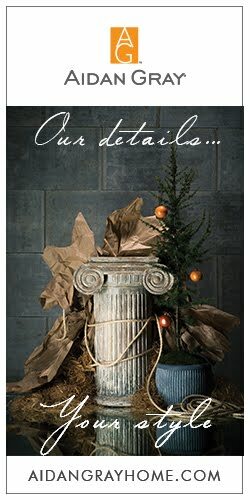 A good decorator can save enormous amounts of money; and also protect clients from the wastefulness of "mistakes. My resources and my "people" are immensely talented and they work for "the trade" only. Upholsterers and artists and all of the people that make my vision come true are completely indispensable and are not available to the general public. I do not charge by the hour; nor charge full retail. My clients for my entire career have been appreciative and many are still using me after 40 years! I do not pay what my clients pay; but nothing is ever given to me by any of my resources. My commission when I sell to a client is the "discount" given by my resource. In addition, I charge a "design fee"; which varies according to the size of the project. How do you determine your "design fee", Penny. Is it a percentage of the total cost of the project or based on your hours working on the project. If it is the latter, you are charging by the hour. You can tell that someone edited that reply for poor Penny. Good God! I cannot tolerate people being so incredibly cruel to someone who is just making lighthearted comments and enjoying the post. There is a difference for me in my preferences when it comes to actually sitting in a room and seeing a photograph of a design in a room. I can imagine that in person I would LOVE sitting in one of her rooms and just taking in all the details. I can imagine her rooms as a the feast for the eyes. However, in photographs I prefer rooms that have been edited and I can see a balance between having a place for my eye to rest and noticing the pretty details. What do you all think? Is there a difference in your preferences in design based on how you experience a space in person or in a photograph? For me, I know when I see art in person it feels quite different than seeing it photographed. Very nice blog regarding modular kitchen, really appreciate the efforts. For Modular Kitchen Manufacturers in Delhi kindly refer to the link.